Jennifer Garner and Ben Affleck’s imminent divorce has caused a media firestorm, but Jennifer is determined to put on a brave front with a smiley facade. She is making a desperate attempt to prove to skeptics that she and Ben’s marriage is just fine. Ben Affleck might be an award-winning actor – but he won’t be nominated for any Oscars for his latest performance. 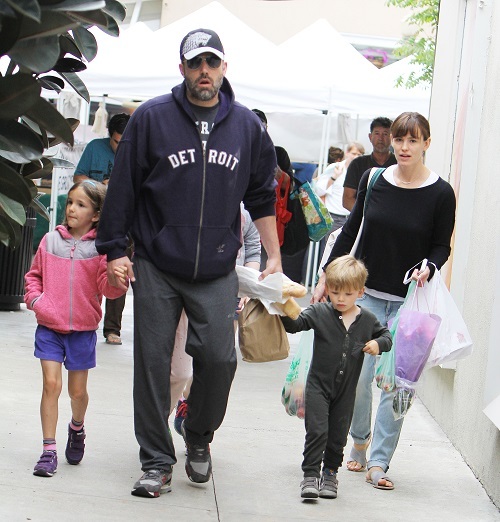 Ben, Jen, and their daughter Seraphina travelled to the farmer’s market together, and Jen smiled for the paparazzi – trying to create the façade of a happy couple. Ben Affleck’s performance was not up to par though. According to the June 29 edition of OK! Magazine, it was obvious that Jen’s smiles were all an act – and the rumors of a divorce are much more true than they are false. At this point, Jennifer Garner needs to stop worry about what everyone else thinks, and do what is best for her. If Ben cheated on her, ditched her on her birthday, and has been abandoning her and the kids for weeks on end – who cares what people think if she divorces him? If anything, she should be embarrassed to be seen out and about smiling in public with him, not embarrassed to be divorcing him. Do you think that their marriage is over? Or could they still work it out? Let us know what you think in the comments below!